A Howell Jolly body is seen in one red cell (A). 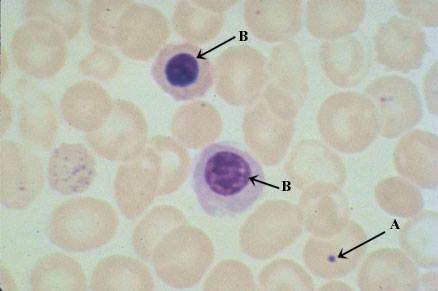 Also present are two nucleated red blood cells (B). Nucleated red blood cells (NRBCs): they may look at fist similar to small mature lymphocytes but a careful comparison reveals clear differences. Nucleated red cells have a moderate amount of pink cytoplasm, with a central nucleus and clumped chromatin, often with some open spaces. Mature lymphocytes have a thin rim of blue cytoplasm, a nucleus with dark chromatin (no open spaces) that takes up almost the entire cell.